One of the oldest conventions we believe in is "Women love shopping." Of course, most of us do and are proud about it. Why shouldn't we be? If you are dressed nicely and look well put-together, it creates a lasting impression. So it is very important to make your purchase keeping in mind style, fashion, and trend. And that is what the online portal Loco En Cabeza (Spanish word which literally means crazy) is all about! It offers trendy fashionable clothing which is contemporary and effortlessly stylish to inspire women. Their collection is casual and laid back placing much emphasis on detail and quality. Let's take a peek into the wonderful women's dresses, women's rompers and jumpsuits, women's tops, women's pants and women's hoodies which they got to offer! Any fashion brand should keep in mind what a woman thinks and wants. Loco En Cabeza assures the same and their collection of affordable women's dresses in different styles and colors is the best example. Take a look and you will never be disappointed. Attention to all the fashionistas! The cutest rompers and jumpsuits that any woman would love to have in her wardrobe are available at the best budget for casual as well as special occasions at this amazing women's fashion brand in India. A good pair of jeans and top is a trend forever and suits the woman of today. 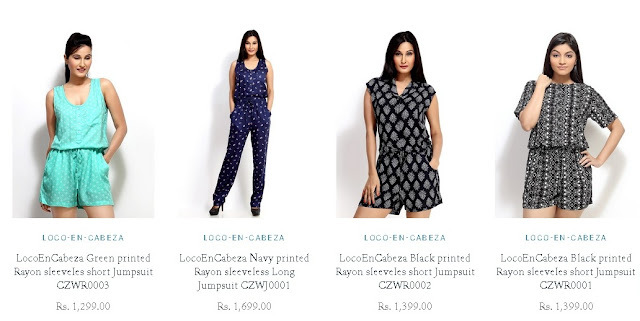 Casual, chic and season inspired varieties of tops at Loco En Cabeza will surely make all the shoppers happy! Be it Capri's or Palazzo Pants, when paired with the right top and accessories can create a super fashionable and smart look. Want to be the diva you always dreamed of? Try these casual yet charming pants and you will never look back. The winter is here! So why not wear the best hoodies available in the market. Long sleeve hoodie sweat jackets are the current trend and these amazing colors will surely impress you. After a quick tour of these unusual and classic collection of women's clothing online, I am sure you would not want to delay any further. Loco En Cabeza now offers a discount of 15% to all the Diva Likes readers. Use the promo code "diva15" while checkout and grab the best attire at the best possible rates only at Loco En Cabeza. The prices mentioned on their site include all taxes and they offer free shipping across India. Have fun shopping! Love the chic jumpsuits.. looks so comfortable..